The dancer Senga (Paige Davis) has suffered a potential career ending injury. Kevin Sprague photos. Ever’s (John Criani) reaction to an attempt at touching has sent her sprawling. The projected excerpts of lectures by Michael McManmon seemed superfluous. Slowly and cautiously learning to seunsulously touch, trust and feel. Their eventual joyous dance was emotionally overwhelming for the audience. 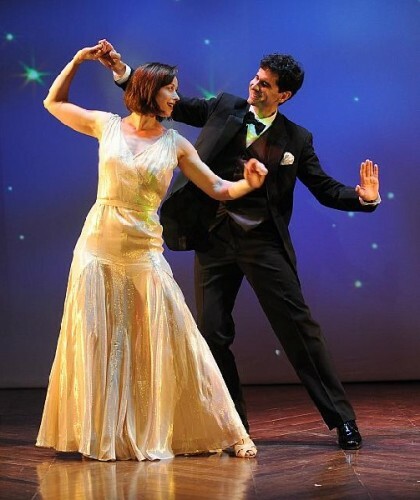 The insightful, poignant, witty and hilarious romantic comedy Dancing Lessons is the ninth play and eighth world premiere by Mark St. Germain for Barrington Stage Company. 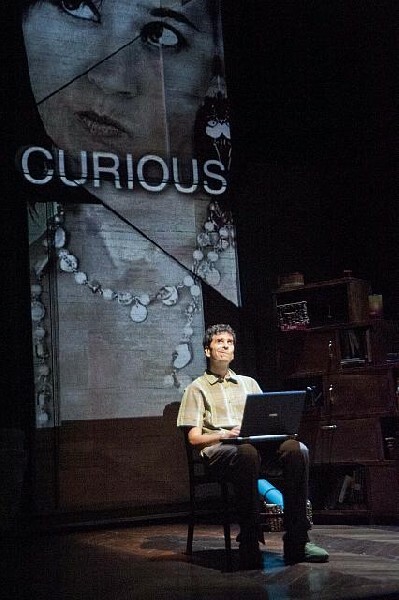 It is skillfully directed by the artistic director of the company, Julianne Boyd. 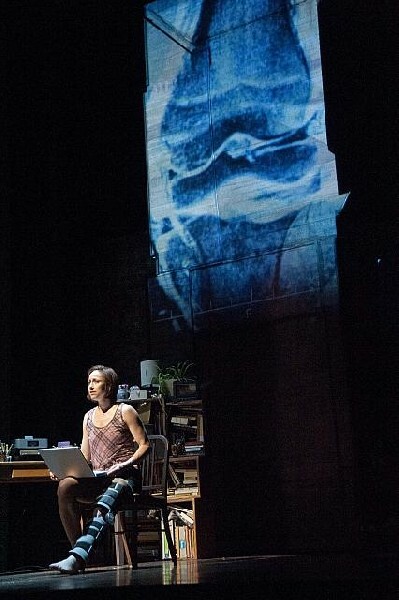 This latest play is a signifier of their remarkable relationship and track record of developing top notch new works. We have grown accustomed to superb plays from St. Germain, several of which are currently in production following Barrington debuts. Dancing Lessons ranks with his very best works. It is also a departure as St. Germain is known for plays based on compelling historical figures and circumstances. His typical approach entails meticulous research, often with several projects in the works simultaneously, into the history and biographies of his subjects. Here, however, instead of researching an individual he explored a condition, Aspergers a form of Autism. From this fairly common but not readily understood syndrome he created a complex and fascinating character and situation. He described this process to me as liberating from his usual methodology. There was a staged reading of the play last fall at Barrington that was immediately compelling. There was an insightful talk back with many in the audience from the community with aspergers. Typically, Boyd has initiated an educational program related to the production. A significant partner in this effort is Michael McManmon who founded the College Internship Program in 1984. The Pittsfield based CIP provides a transition from high school to college and success in negotiating the world of Neurotypicals for young Aspys or individuals with Asperbergers. Last summer John Cariani in a Barrington debut gave a stunning performance with remarkable physical comedy as Dogberry in Much Ado About Nothing. It immediately became apparent to Boyd and St. Germain that he was perfect for the demanding and sensational role of the multi valent Ever Montgomery. His performance as a high functioning Professor of Geosciences at the New York Institute of Technology is so riveting, nuanced and astonishing that much of the out of the park success of this sure fire hit is based on his benchmark performance. It assures that he is a go to member of the Barrington family of distinguished artists. Remarkably, the two finest male lead performances of the Berkshire 2014 season have occurred back to back on Barrington’s Main Stage. 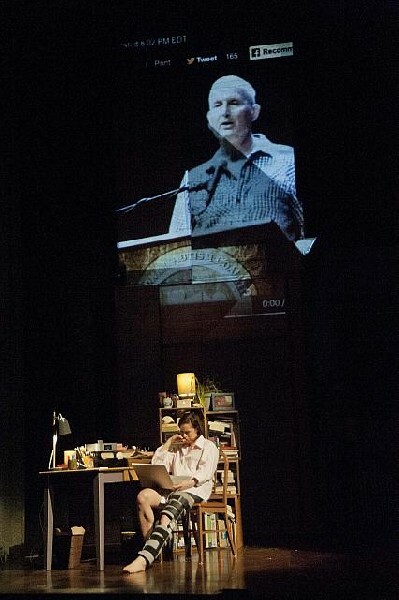 Previously Mark H. Dold was astonishing as Alan Turing in Breaking the Code. It was a hard act to follow but Cariani has matched and possibly trumped Dold’s career defining performance. They are both front runners for end of the season’s awards lists. While all involved swear that it’s a coincidence both characters had a common denominator of Asperger. A year ago I knew nothing of this condition but now we have seen two plays on the subject at Barrington and add to that the fabulous The Curious Incident of the Dog in the Nighttime which we saw in London last fall. 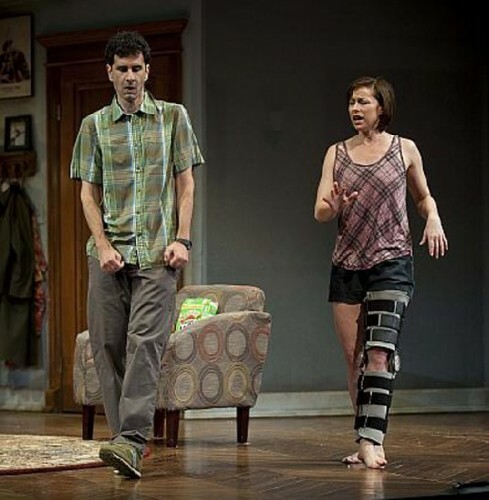 Although this play is built around Cariani’s character and his unique condition he has been given total support by Paige Davis as his severely injured neighbor and sidelined Broadway dancer Senga Quinn. Since last year’s reading her character has become further developed with a back story of physical and emotional damage that now matches his. It results in a more credible mutual attraction overcoming a series of seemingly impossible obstacles. When their truly outrageous mating game finally culminated in a glorious dance, like many in the audience, I was choking back empathetic sobs. It was shattering and joyous to see them overcome such impossible odds. With fits and starts they groped toward a plausible relationship. Consider a dancer grounded with a broken wing hooking up with a professorial geek with a phobia about touching. What are the Vegas odds on that? About to be honored at an awards ceremony Ever wants to fit in with Neurotypicals (so called normal people). One aspect of this will be at least one dance during the gala. Preferably for Ever a fast one that entails no touching. Knocking on the door of a neighbor, Senga, withdrawn from the world with an injury from which she may never recover (there are complications), she is self medicating with pain killers and booze. This is one miserable woman. He asks if he is interrupting a suicide and if so can come back later. Go away and leave me alone is her initial response. Through the door he asks for a brief meeting to explain a proposal. Doing the math it is hard to refute his logic. As a part of his condition, however, Ever can’t read between the lines. He has to rely on an objective and scientific approach of making observations and evaluating data to deconstruct relating to Neurotypicals. While focused on his work and research he’s a genius but relating to the real world is impossibly complicated. Romantic and sexual relationships are seemingly out of the question. Typically, he has no means of processing for understanding her jokes. While his straight lines and wacky logic has the audience in stitches. His only ersatz friend is Rudolfo the building super who loves sports. To get along he bones up on sports which in reality make no sense to him. He is relieved to learn that Senga is not into sports so there will be no need for that socializing charade. During the actual dancing lesson he follows her instructions with literal movements and utterly no feeling or sense of rhythm. His moves are so outrageously spastic that they evoke the kind of brilliant sight comedy one associates with masters like Chaplin and Keaton. While sidesplittingly hilarious St. Germain introduces a lot to think about. Not just enriching our understanding of Asperger but we are also floored by Ever’s deadpan account of the imminent collapse of the earth’s species and ecosystems. But, not to worry he comments, since we live on average just 78 or so years, most of us won’t be around for the inevitable extinction of the human race. Given the current rate of fouling the planet our demise is now calulated to a few generations. This is precisely what I have been thinking about. Now in my 70’s doing the math I won’t be around but I fear for the lives of our grandchildren when they are our age. What will be the quality of life on earth for their children? A logical question involves how plausible is St. Germain’s character? Based on meticulous research Ever is entirely credible. Senga is stunned by this information. He creates an analogy to explain the complexities of a task like learning to dance. What starts as a strictly cash contract evolves into something else. Alone and severely damaged Senga is isolated and perhaps suicidal. Dancing has been her life and without it possibly there is no reason to live. Initially, Ever is a freak to her but slowly she sees him as honest, sincere, trusting, vulnerable and eventually attractive. How they fitfully evolve as lovers is intriguing and heart wrenching. This evolution has us totally absorbed and emotionally overwhelmed. It’s some of the best 95 minutes of theatre that one could hope for. With some notes. The scenic design by James J. Fenton perfectly created the sense of Senga’s shabby, expensive, New York high-rise apartment. Suiting her melancholy there were askew accents. Like the disconfigured window shade. It signifies a woman who regards her living space as nothing more than a place to rest her body when not on stage. The video projections by Andrew Bauer were more distracting than enhancing. When they finally copulate, for example, we see wild beasts. Jungle fever! Their words and mimed emotions are contrasted in another sequence. The short projections of McManmon on Asperger seemed gratuitous. The drama itself conveyed all we need to know about the condition. With a superb script and two remarkable actors it felt that Boyd was overreaching to make the experience more theatrical. It wasn’t necessary. It was counterproductive to push the carefully constructed reality of their plausible interaction into another dimension. Based on what are sure to be rave reviews this production may tour for several years. With a stunning script in one act at 95 minutes, a tight set, and a cast of two, Dancing Lessons is likely to have a long life in regional theatre. By any measure Dancing Lessons is among the top five of best plays during the 2014 Berkshire season.